Did you konw that potato chips were invented by mistake? Potato chips were invented by a chef called Geoge Crum. They were invented in 1853. First Geoge Crum cut them really really thin, then he cooked them for a long time until they were crispy . And he spinkle lots of salt on them so they were really salty. He thought the customer would hate them, but the customer loved them and asked for more. The original potato chip was said to be created by a cook named George Crum,who was trying to appease an unhappy customer.The customer kept sending his fried potatoes back,complaining that they were too thick.Frustrated,he sliced the potatoes razor thin,fried them until crisp and seasoned them with extra salt.To Crum's surprise,the customer loved them.They soon became famous. Potatoes are the main food around the world,the consumption after rice.In Europe and the United States table,potato daily eating is French fries and chips.Potato chips is the western most common side dishes,but it has only a history of over 100 years,its invention by accident. 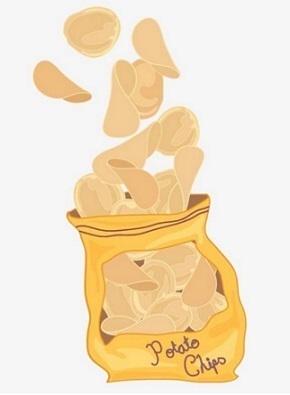 The invention of potato chips is a Native American,named George Garin. One day in 1853,Eastern New York resort restaurant chef George Garin as usual and fries,one of the guests think he fries coarse,and Garin to French fries,still not satisfied.Angrily,he simply put the potatoes cut into thin slices pot.He wanted to,deep-fried crispy potato chips after the thin,certainly not fork to eat,can play to spite his guests.Who knows,potato chips on the table,the visitor soon put the chips up,be profuse in praise.Since then,crisps became a famous dish in the restaurant.The restaurant is on the packaging,convenient for customers to take food.Of course,due to peel the potatoes chips on hand,extremely limited yield. Potato chips is widely popular is nineteen twenties . ".The use of the car salesman Hao chips shipped to all parts of the United states.In 1961,he put his crisps company and Texas the frito company merger,vigorously promote his Hao Li chips,so that the chips gradually popular all over the world. My good friendI have a good friend.she is Mary Smith.she first name is Smith.she last name is Mary.she is tall and thin. 再答： she like read book. I love her. © 2019 wesiedu.com | webmaster@wesiedu.com(低俗回答举报邮箱) | 17 q. 0.023 s.